As you may know my trade I am an independent film maker having worked teaching film to young people and running my own film festivals. Part of this is making sure I support my fellow artists as much as I can by attending film festivals, watching others films and getting my bum to art exhibitions. Independent short films are a great way to discover new talent or get a bite size taste of a genre you may not have sampled before. When I found Discover film I was so excited I had to share them with you! 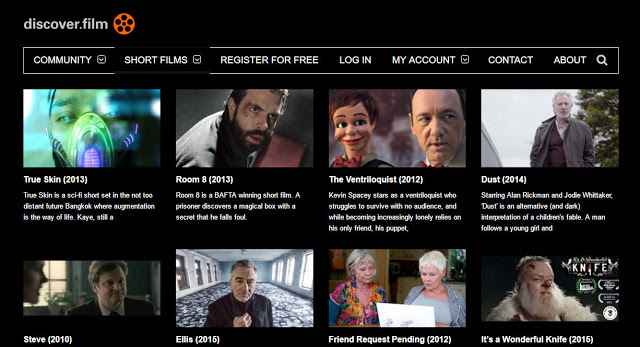 Discover film is a fantastic online resource which pools together independent talent from all over the world. Show casing short films of all genres and better yet it is free to join so isn't going to cost you anything. You can create a profile and show support by rating and reviewing the short films you have watched helping new artists get their work seen by more people. Ultimately as a film maker all you want is for people to see and appreciate your art. There are pages of films to watch so if you are a bit bored of Netflix and looking for something new to keep you entertained then this is a fabulous alternative. Easy to use and no long forms to join I managed to sign up and was watching a short film within minutes. There is something for all tastes with a wide range of categories making independent film more access-able to everyone. There is even a point system in place where you gain points for visiting the site or watching films which can unlock additional extras such as interviews and behind the scenes or you can opt to use your points to go into a monthly prize draw. If you are a film maker yourself then you will be able upload your own films but also network with fellow film makers. Networking is key in the film world and is a fantastic way to find more crew or even collaborate with other artists. You can get advice on the best equipment to use on an upcoming shoot or for me the dreaded one was finding quality actors on a low budget. There is even a film festival! Last year Discover film ran a film festival in London and it went so well that in September to October this year there will be another. So much hard work goes into putting film festivals together (Trust me I ran one for 3 years) so a lot of respect goes to discover for bringing us another place to celebrate home grown talent. If you have a quality short film you can enter your work into the festival and have a chance to win yourself some recognition for your hard work and have your film screened in the phoenix theatre in London. If that isn't an excuse to make a film then I don't know what is. You can also find out about the winners of the last festival over on the website. In all I am really impressed with the quality of networking, film and opportunity Discover Film is offering so make sure film maker or not you go check them out and show them some support. Never made a film , Though helped make music videos. Sounds really good and I do get bored of netflix. Im a fan of watching something different. Oh wow that is such a cool idea! I have to be honest and say I don't really watch any independent movies but I'm definitely going to give this a go! Great post! Sounds like a fab site and opportunity! This sounds fantastic for inspiring film makers which sadly I am not but still seems like a good opportunity to see what's out there. Wow what a great idea, my boyfriend used to make films (and my big brother but that was back in the eighties! He went on to work with the BBC on wildlife documentaries) and this would have been really useful for him. This sounds like such a good site for filmmakers. I did a media production course at college and part of that was film making - doing that course made me realise how many things go into making films, it's so hard work and many of the smaller directors don't always get the rewards they deserve. This sounds really interesting for film makers although it's not really something I know anything about. It sounds like a great source to discover new films. I've not watched enough independent movies but that has to change! I never knew you had a film site or that you were an Independent film maker. I like that there are alternative films on there. What a fantastic idea, I like the idea of supporting independent film makers. I have never made a film and would have no idea how to but this is great for those who do make them! I have not made a short film before except for play but this sounds like a great resource for short film. Thanks for sharing this with us. I'll definitely check them out, I don't really watch many films but I'd like to watch more independent films. This was fascinating, I can just about take a photo never mind make a film!